You can read how the staff here at BGSUHockey.com voted by clicking here. Bowling Green is expected to finish in the top half of the Western Collegiate Hockey Association this season. The Falcons finished fourth in the WCHA coaches poll and third in the media poll, which were announced during a conference call Monday afternoon. BG received 57 points in the coaches poll to trail Minnesota State 81, Ferris State 67 and Michigan Tech 64. In the media poll, MSU was first with 256 points, followed by Ferris State 226, BG 180 and Tech 178. “It’s probably where I expected with everybody,” said BG coach Chris Bergeron, who is in his fifth season. “What we’re telling our team is I don’t think we’re sneaking up on anybody anymore. The Falcons tied with Alaska (Fairbanks) for third in the WCHA last season. BG finished 18-15-6 overall and 13-11-4 in the WCHA, beating Tech in a first-round playoff series before losing to MSU in the WCHA semifinals. 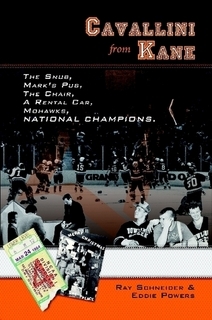 MSU went on to win the league playoff title after Ferris won the regular-season WCHA championship. “(MSU) is the team to beat in our league,” Bergeron said. “Obviously, Ferris is still great, and I’m a fan of Michigan Tech. Top to bottom, it’s a great league. For us to be picked third or fourth, we’re happy about that. But that stops right now. ROY: BG freshman defenseman Mark Friedman was named the media’s newcomer of the year. Friedman was a third-round pick of the NHL’s Philadelphia Flyers in June. The media’s player of the year was MSU senior forward Matt Leitner. In the coaches voting, Ferris senior goalie C.J. Motte was the player of the year, and MSU forwards C.J. Franklin and Brad McClure were the co-rookies of the year. ALL-WCHA: No Falcons were named to the preseason all-league teams selected by the coaches and media. The coaches team consisted of Motte; junior Colton Parayko of Alaska and senior Zach Palmquist of MSU on defense; and Leitner, junior Tyler Morley of Alaska, and senior Jean-Paul LaFontaine of MSU at forward. The media team consisted of Motte, Parayko and Tech sophomore Shane Hanna on defense; and Morley, LaFontaine and Leitner at forward. YEAR TWO: The revamped WCHA is in its second season following college hockey’s massive realignment after the 2012-13 season. Before joining the WCHA last season, BG was a charter member of the now-defunct Central Collegiate Hockey Association, which was formed in 1971. BG goes to Anchorage for the first time as a WCHA member this season. The Falcons haven’t been to Bemidji State for a WCHA series, but they did go there for a nonleague series during the 2011-12 season. NEW: Bill Robertson is starting his first season as the commissioner of the WCHA. He is a former executive with the NHL’s Minnesota Wild. “We want to stabilize the WCHA and keep it a premier conference in college hockey,” Robertson said. The WCHA Final Five will be held at the Xcel Energy Center in St. Paul (Minn.) this season. The event was held in Grand Rapids (Mich.) last season and returns there in 2017, and also will be in St. Paul in 2018. NEXT: The Falcons are holding limited team and individual workouts this month under NCAA rules. Teams can’t start official practice until Saturday. The Falcons’ first official day on the ice has them hosting Simon Fraser University (British Columbia) in an exhibition game at noon. BG begins the season with a home-and-home series against Miami. The teams play Oct. 10 at BG and two days later at Miami. NATIONAL POLL: The Falcons received 11 points for 30th place in the first U.S. College Hockey Online poll announced Monday. Also from the WCHA, Ferris was ninth, MSU was 13th, Tech was 27th and Alaska (Fairbanks) was tied for 34th. Forty-two of the nation’s 59 schools (71.2 percent) received at least one point in the poll. RULES: Among the points of emphasis from the NCAA is the elimination of diving to draw penalties. There also will be a crackdown on delaying tactics by defending teams after icing calls. Now, players on the team guilty of icing head to the bench for a minute or so to rest, since the team is not allowed to change players before the faceoff in the defensive zone. The first violation results in a warning, and the second offense will be a delay of game penalty. Shepherd said officials will be in position to prevent those players from going to the bench once icing is called. Centers no longer are allowed to play the puck with their hands on a faceoff. The offense will result in a minor penalty for delay of game. The NHL already uses that rule. Shepherd said if the attacking team shoots the puck at the net in the offensive zone and the puck is tipped by the attacking team and goes out of play before it hits the goalie, the faceoff will remain in the offensive zone. Previously, the faceoff came outside the offensive zone. “The rules committee felt more scoring is needed in the college game,” Shepherd said. Also, violations for a hand pass or playing the puck with a high stick by the offending team will result in a one-zone penalty on the faceoff. If the violation was in the offensive zone, the faceoff will be in the neutral zone. Previously, the offending team was penalized with a defensive zone faceoff. Goalie interference remains a point of emphasis. SFU: Simon Fraser already has played three exhibitions and two regular-season contests. SFU is coming off a split against Eastern Washington, posting a 4-1 win in Game 1 and dropping a 5-2 decision in Game 2. The team completes its two-game trip to Ohio Sunday when it plays at Miami. RECRUIT: Stephen Baylis, a left wing for the Carleton Place Canadians in the Central Canada (Junior) Hockey League, has verbally committed to play for the Falcons. The 6-foot-1, 185-pounder is expected to join BG for the 2015-16 season. He had 36 goals and 55 assists in 78 games for the Canadians last season. He also had 115 penalty minutes. Baylis, who turned 20 years old Aug. 1, is from Ottawa, Ontario. The Falcons will have at least five other recruits next season. They consist of three forwards and two defensemen. Two other forwards also could start their BG careers next season.